Since 1979, Hammerworks Colonial Outdoor Wall Light Tall Ship W109 has been meticulously handmade with attention to detail. Most importantly, we make our Colonial Wall Lanterns in America. First & foremost, we handcraft each copper Colonial wall light in a choice of solid copper or brass. Hence, this insures that you will consistently receive a solidly built wall light. Therefore, our reproduction wall lanterns will illuminate any entryway to your Early American home for generations. Most of all, the attractive design adds beauty and curb appeal to any home. If you prefer Traditional Wall Lanterns for your home, we have several options to consider. Traditional Wall Lanterns Small Sturbridge WML102 are an especially popular choice. You can easily pair them with Traditional Home Wall Lights WML112. Most importantly, we offer lighting options ranging from 2 to 4 candle clusters. Therefore you can easily achieve enough illumination for your setting. No matter which size and style you prefer, you can be assured of receiving superb quality and value from Lighting by Hammerworks. We also offer a wide variety of Colonial Post Lanterns to complement the Colonial wall lanterns. 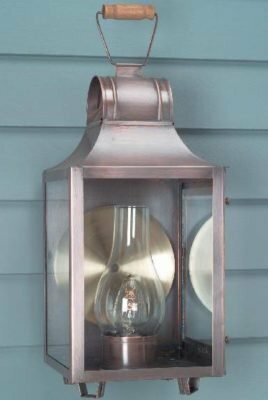 Whether you prefer the classic Colonial Boston Post Lantern P103 or the simply rustic style of Cape Cod Copper Post Lanterns Pyramid PP119, we have the post mounted fixtures you want. As always, we handcraft each Early American post light in a choice of antique copper or brass. In addition, you can also choose from the custom finish options of verdigris or painted black. Most importantly, no matter the size or style, each handcrafted post lamp is equipped with an industry standard 3″ post fitter. Therefore you can choose from our selection of Colonial Style Light Poles to mount your outdoor copper post lanterns.